1. Break, Interruption : خلل - رکاوٹ : (noun) some abrupt occurrence that interrupts an ongoing activity. 2. Break : توڑنا : (verb) render inoperable or ineffective. 3. Break, Interrupt : ختم کرنا : (verb) terminate. 4. Break, Bump, Demote, Kick Downstairs, Relegate : درجہ کم کرنا - تنزلی کرنا : (verb) assign to a lower position; reduce in rank. 5. Break, Come Apart, Fall Apart, Separate, Split Up : ٹکڑے ہوجانا - ٹوٹنا : (verb) become separated into pieces or fragments. Lest the bottle should break. 6. Break, Breach, Falling Out, Rift, Rupture, Severance : ناچاقی - علیحدگی : (noun) a personal or social separation (as between opposing factions). 7. Break, Bust : خراب کرنا : (verb) ruin completely. 8. Break, Recess, Respite, Time Out : وقفہ : (noun) a pause from doing something (as work). 9. Break : ٹکڑے کرنا : (verb) destroy the integrity of; usually by force; cause to separate into pieces or fragments. Shatter - cause to break into many pieces. 10. Break, Breakage, Breaking : ٹوٹنا - ٹوٹ پہوٹ : (noun) the act of breaking something. 11. Break, Breach, Go Against, Infract, Offend, Transgress, Violate : خلاف ورزی کرنا - وعدہ خلافی کرنا : (verb) act in disregard of laws, rules, contracts, or promises. 12. Break, Intermission, Interruption, Pause, Suspension : وقفہ - ٹھہراوٴ : (noun) a time interval during which there is a temporary cessation of something. 13. Break, Break Away, Break Out : بھاگ جانا - اچانک بھاگ نکلنا : (verb) move away or escape suddenly. Break Loose, Escape, Get Away - run away from confinement. 14. Break, Fracture : ہڈی کا ٹوٹنا : (noun) breaking of hard tissue such as bone. 15. Break : بکھر جانا : (verb) scatter or part. Disperse, Dissipate, Scatter, Spread Out - move away from each other. 16. Break : دراڑ : (noun) the occurrence of breaking. 17. Break, Break Off, Discontinue, Stop : روکنا - ختم کرنا : (verb) prevent completion. 18. Break, Break In : ناجائز طور پر داخل ہونا : (verb) enter someone's (virtual or real) property in an unauthorized manner, usually with the intent to steal or commit a violent act. Intrude, Trespass - enter unlawfully on someone's property. 19. Break, Break In : قائل کرنا - تابیدار بنانا : (verb) make submissive, obedient, or useful. Domesticate, Domesticise, Domesticize, Reclaim, Tame - overcome the wildness of; make docile and tractable. 20. Break, Disruption, Gap, Interruption : رکاوٹ - خلل : (noun) an act of delaying or interrupting the continuity. 21. Break, Go Against, Violate : خلاف ورزی کرنا : (verb) fail to agree with; be in violation of; as of rules or patterns. 22. Break, Bring Out, Disclose, Discover, Divulge, Expose, Give Away, Let On, Let Out, Reveal, Unwrap : راز فاش کرنا : (verb) make known to the public information that was previously known only to a few people or that was meant to be kept a secret. 23. Break, Breakout, Gaolbreak, Jailbreak, Prison-Breaking, Prisonbreak : جیل توڑ کر بھاگنا : (noun) an escape from jail. 24. Break, Break Down, Conk Out, Die, Fail, Give Out, Give Way, Go, Go Bad : خراب ہو جانا : (verb) stop operating or functioning. 25. 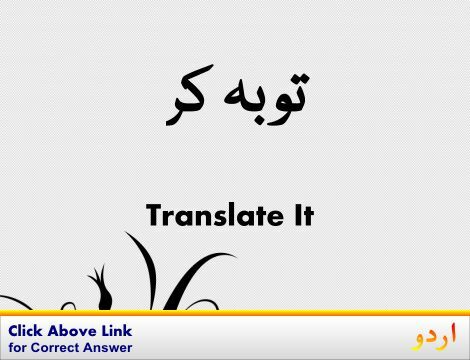 Break, Damp, Dampen, Soften, Weaken : شدت کم کرنا - کم کرنا : (verb) lessen in force or effect. 26. Break : ختم ہو جانا : (verb) come to an end. 27. Break : چھوڑ دینا : (verb) give up. Cease, Discontinue, Give Up, Lay Off, Quit, Stop - put an end to a state or an activity. 28. Break : واقع ہونا : (verb) happen or take place. 29. Break : کالعدم کرنا : (verb) invalidate by judicial action. Annul, Avoid, Invalidate, Nullify, Quash, Void - declare invalid. 30. Break, Break Up, Part, Separate, Split, Split Up : بچھڑ جانا - الگ ہو جانا : (verb) discontinue an association or relation; go different ways. 31. Break, Bankrupt, Ruin, Smash : دیوالیہ کر نا - قرضدار بنادینا : (verb) reduce to bankruptcy. 32. Break, Cave In, Collapse, Fall In, Founder, Give, Give Way : گرنا - ٹوٹ جانا : (verb) break down, literally or metaphorically. 33. Break : کھلا کرانا : (verb) exchange for smaller units of money. Change, Commute, Convert, Exchange - exchange or replace with another, usually of the same kind or category. 34. Break, Bust, Fall Apart, Wear, Wear Out : ٹوٹ کر بکھر جانا - ٹوٹ جانا : (verb) go to pieces. 35. Break : گھسنا : (verb) pierce or penetrate. 36. Break, Get Around, Get Out : عام ہونا : (verb) be released or become known; of news. 37. 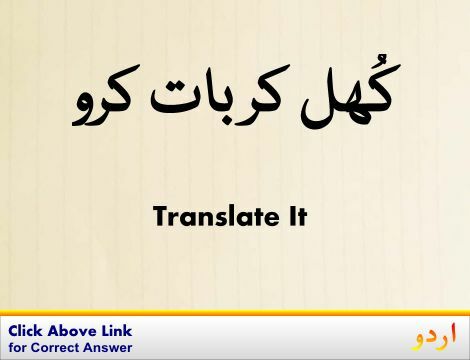 Break, Intermit, Pause : کچھ دیر کے لیے روکنا - معطل کرنا : (verb) cease an action temporarily. 38. Break, Develop, Recrudesce : ہونا - ظاہر ہونا : (verb) happen. 39. Break, Check, Crack : چٹخنا : (verb) become fractured; break or crack on the surface only. Inoperable : ناقابل عمل : not able to perform its normal function. Interpret, Render, Translate : ترجمہ کرنا : restate (words) from one language into another language. 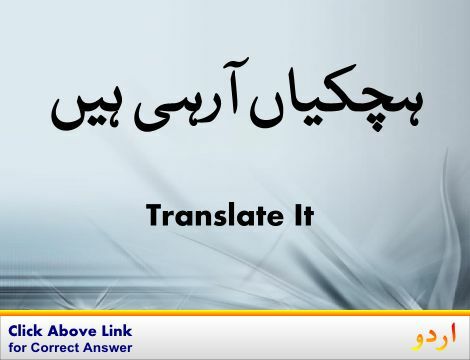 "I have to translate when my in-laws from Austria visit the US"
Break Apart : ٹکڑوں میں بٹنا : break up or separate. Breadbox : روٹی یا کیک رکھنے والا ڈبہ : a container used to keep bread or cake in. How this page explains Break ? It helps you understand the word Break with comprehensive detail, no other web page in our knowledge can explain Break better than this page. 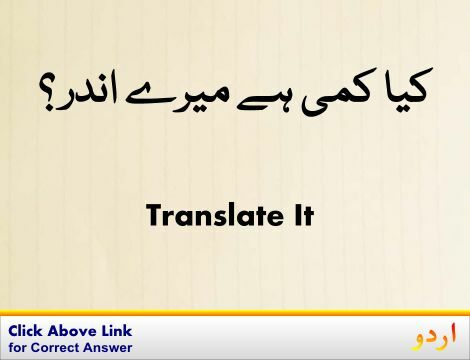 The page not only provides Urdu meaning of Break but also gives extensive definition in English language. The definition of Break is followed by practically usable example sentences which allow you to construct you own sentences based on it. You can also find multiple synonyms or similar words on the right of Break. All of this may seem less if you are unable to learn exact pronunciation of Break, so we have embedded mp3 recording of native Englishman, simply click on speaker icon and listen how English speaking people pronounce Break. We hope this page has helped you understand Break in detail, if you find any mistake on this page, please keep in mind that no human being can be perfect.